Flyback Transformers, a type of switching transformer, come in two flavors, CCM (Continuous Conduction Mode ) and DCM (Discontinuous Conduction Mode). The DCM version is the one we will develop here…. The idea of the DCM flyback switching transformer is that the SEC current drops back to zero before the next ON time for the PRI. Generally a DCM flyback is designed at the point between CCM and DCM. When the switch is ON the PRI inductance is storing energy due to a PRI current. The moment the switch is turned OFF the energy stored is then…. This energy is then transferred to the SEC side where the load attached depletes that energy. The DCM is depleted entirely of it’s SEC energy before the next ON time the PRI sees. The number of times per second this occurs is the power delivered and is this energy multiplied by the frequency. Now, the voltage across the PRI inductance is given as below…. This says the peak voltage and the duty cycle are equal to the inductance, peak current and frequency. We can then arrange the power equation as follows….. Substituting one into the other we get….. Therefore we have found the peak current reached in the PRI side to be…. With this current we can then find the needed PRI inductance as follows…. The turns ratio for the DCM is as follows…..
And peak SEC current is related by the inverse of this ratio…. Ok…. now we need to find the MIN number of PRI turns…. we will use the inductor equation (easily derivable from Faraday’s Law of Induction)…..
We know the peak PRI current and the PRI inductance. Choose a core with an appropriate core area and use a flux density that you want as a MAX flux density for your core to obtain the MIN number of PRI turns…. SEC turns are just a function of the turns ratio and these PRI turns…. Now set/define the gapped AL value for the transformer as the ratio of the PRI inductance to the square of the PRI turns (this can be converted to an actual gap distance if needed by using reluctance equations)…. The only item left would be to choose an appropriate wire gauge. You can use a current density of 2~4A/mm^2 to get this. If the DCR is quite low you can likely go larger, but the 2 to 4 range is most always safe; we’ll use 3 here. This is the wire diameter that will work. Keep in mind a switching transformer is usually switched at high frequencies and so using solid gauge wire will likely not be a good idea due to skin depth issues. So choose an appropriate Litz wire of an equivalent gauge/diameter. This is sort of an iterative process that results in a switching transformer that meets your needs while being about as small as possible in doing so. 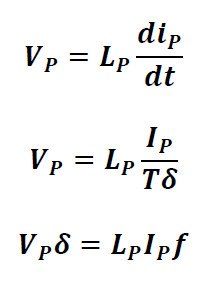 Remember also all of this accounts for no core losses, no regulation due to DCR, no leakage flux, etc…this is the ideal case and is not reality but these equations and this approach will certainly get you quite close to what you need.